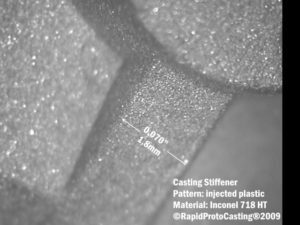 RapidProtoCasting developed its precision casting equipment and processes to deliver the most accurate, precise high quality complex castings possible. Sharp outside corners and edges. Thin internal slots: 0.030″ (0.8mm) stainless steel and Inconel castings. RapidProtoCasting’s proprietary equipment and processes delivers the most complex precision thin-wall castings available. 0.010″ (0,25mm) thin-wall stainless steel castings and thin-wall Inconel castings. 0.020″(0,5mm) thin-wall copper and thin-wall titanium castings. 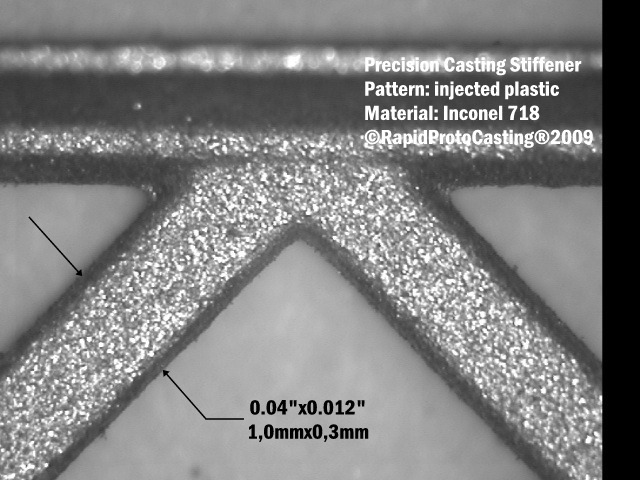 Finished casting surfaces are evaluated at 1x or 5x magnification with the exception of surfaces that are specifically indicated as not critical by the customer, surfaces to be removed during later processing or surface areas used for gating, stiffeners or risers with prior customer agreement. General surface acceptance standards are per ASTM A997-98, Standard Practice for Investment Castings, Surface Acceptance Standards, Visual Examination, except as modified below. Negatives (Pits): Less than 0.02″ (0.5mm) diameter and less than 0.01″ (0.25mm) deep, no more than four per square inch (645mm2). Depth of any negative not greater than 50% wall thickness. Positives (high metal): All positives will be blended to +0.010″/-0.002″ (+0,25mm/-0,05mm). Linear Indications: Linear surface indications will be removed. Castings with linear surface indications that cannot be removed without exceeding blending tolerances will be rejected. Gate Removal: Gates will be removed by hand grinding to +0.030″/-0″ (+0,75mm/-0,0mm) unless otherwise specified or agreed to with the customer. 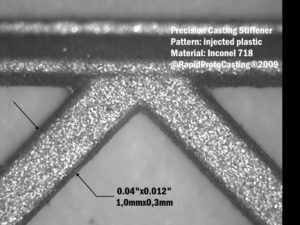 Rapid prototype patterns: Standard 125 micro-inch/Ra (3.2 micro-m/Rz) except for rapid prototype stepping which will be less than 0.008″ (0.3mm). Plastic patterns: Standard 63 micro-inch/Ra (1.6 micro-m/Rz). Finer finishes are available with suitable pattern tooling and for certain cast metals.